SO, it wasn't Canada's first gold medal on home turf, but it was the nation's first medal of the Vancouver 2010 Winter Olympics! I'm, of course, referring to Spruce Grove native Jennifer Heil's silver medal victory on Saturday night (Feb. 13), settling for second place in Ladies' Moguls. American Hannah Kearney edged out Heil's 25.69 points total with her 26.63 score, while fellow U.S. team member Shannon Bahrke took the bronze with a 25.43 final. "I definitely felt like I could have done better," said Heil, 26, who took home a gold medal at the 2006 Winter Games in Turin, Italy. "There's no doubt about it. I was shooting for gold tonight. But I really do feel like I won silver." Currently studying at Montreal's McGill University, Heil was expected to capture Canada's first gold medal on home soil. No Canuck had won any gold either year Canada hosted the Olympics, in 1976 Montreal (Summer) or 1988 Calgary (Winter). One day after Heil's big day (on Feb. 14), however, Montreal skier Alexandre Bilodeau, 22, was bestowed with the honour, after he beat out B.C.-raised Australian Dale Begg-Smith with a score of 26.76 in Mens' Moguls. 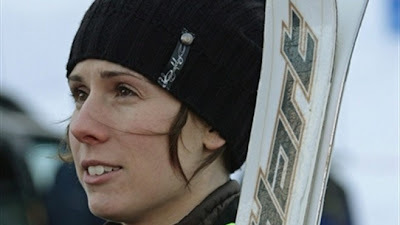 Earlier that same Valentine's Day Ottawa skater Kristina Groves snatched bronze in Ladies 3000m. Stay tuned to "I Heart Edmonton" to see if any other Edmonton or area-based athletes take home any hardware at the 2010 Winter Olympics. Keep them fingers crossed people!